When Biggin Hill was suffering one of its worst raids from German aircraft during the Battle of Britain in 1940, three brave members of the Women’s Auxiliary Air Force (WAAF) remained at their posts. As the building tumbled around them Sergeants Elisabeth Mortimer, Helen Turner and Corporal Elspeth Henderson worked throughout the attack to keep the station operational: they were later awarded the Military Medal for their bravery. This is just one example of how important for British victory were the roles played by the WAAF. The WAAF was first established in 1939 by King George VI. There was previously an Auxiliary Territorial Service (ATS), the female force equivalent to the Territorial Army, but the WAAF itself sprung into being when the Government decided that a separate women’s air service was necessary. The WAAF was not an independent organization, nor was it completely integrated into the RAF. Rather it was interlinked with the RAF so that whenever possible RAF personnel could be substituted for women. Originally the roles of the women of the WAAF were relatively domestic duties such as cooking and driving. Women were certainly not permitted to fly and it seems that their general abilities often doubted in the early years. However, during the Battle of Britain the RAF were under huge strain, resulting in a change of role for the WAAF. 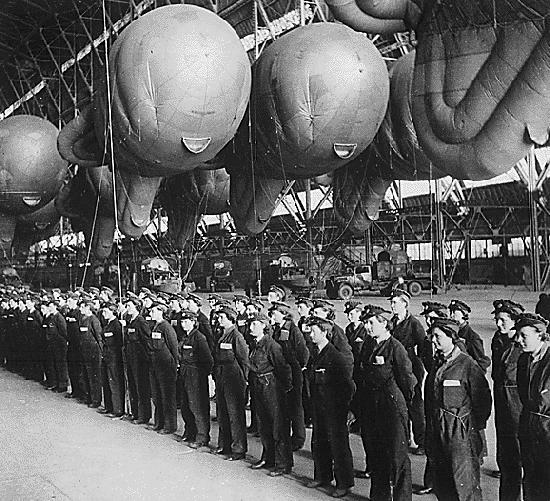 It became essential for the women of the organisation to take on more technical roles, and they were trained in radar plotting, the maintenance of barrage balloons and photographic interpretation. There were several thousand young WAAFs in Fighter Command during that summer of 1940 and they played a vital role in the Dowding system of defence. This was essential during the Battle of Britain and later in guiding night fighters against the bomber formations attacking the UK. Initially, women served as radar reporters, using the huge Chain Home radars to locate raids and report their positions, as well as plotting these reports in the Sector Control Rooms. It was the plotter’s job to obtain information from the signals staff, often WAAFs themselves, who were listening to the reports from radar and Observer Corps’ posts. This information was then transferred to visual plaques on racks which were then positioned on the map, showing the position and direction of the raid as it progressed. Every raid was allotted a serial number and a prefix to indicate if it was friendly, hostile or unknown. Many WAAFs were based at Fighter Command airbases such as Biggin Hill, Hawkinge, and Manston, which put them in great danger: these were all targets in the first raids by the Luftwaffe in the Battle of Britain. Without the tireless work and bravery of the WAAF the RAF would have struggled to cover all the necessary angles, which ultimately could have affected British victory. Many women who were possibly undervalued before their efforts in WAAF were transferred to the after the Battle of Britain had been won. They were not only valuable to the war effort but also to the general role of women in society. Through their exceptional work the women in the WAAF proved that women were fully capable of aiding the British war effort. I am currently writing a book in French on the WAAF in the RAF during the war. This subject if quite unknown in France. I would like to know how I can get original WAAF photographs. Hi Geneviève, i'm Ana and i'm from Brasil. So, i'am writing a paper on the role of WAAF and WRENS during the 2WW as here in Brasil the role of women in the army forces are something new. In 2013 I went to England to search some sources and you can find them at the National Archives at Kew. If you're not able to go there, try the Imperial Museum website, you can reproduce their images in some cases or buy them too! Hope it helped! My Grandmother Monica Fenton Wingate was stationed at Biggin Hill in 1940. I have original photographs that you may be interested in which include signatures. I am interested in identifying the women in the photographs. Please send me your email address and I will forward to you. My mother, Gloria Doreen Hurst, was a radar plotter at Biggin Hill, before, during and after the Battle of Britain. I recently watched Paul Basu's film, 'The Ghosts of Biggin Hill' and to my amazement my mother was in one of the photographs. She was the WAAF of the rhs of the photo showing four WAAF who had just come off duty. Most of my mothers possessions and photos were destroyed during an air raid, but I do have several small photos with names on the back. I may be able to help identifying the WAAF in your photos if you are interested. I would certainly be more than interested in seeing your photos. Hello Gillian Bell! How funny we are both Gillian's! Imagine if our relatives were acquainted at Biggin Hill! I would love to hear more about what you have. My mum was definitely there in 1944 and potentially earlier. I believe I saw here in footage from a BBC special, The Ghosts of Biggin Hill. She was on the telephone (?) in the ops room. It would be great to share more info through email... You can see more picks of my mum at my blog post http://gilliancornwall.blogspot.ca/2013/11/love-and-molecules-lest-we-forget.html Please try to connect through my blog. Ross - I'd love to see anything you have in the event that my mum is in your pictures. Cheers. My mother was a WAAF also at Biggin Hill briefly, I believe, during the Battle of Britain and then in the Leeds area. My mum was at Biggin Hill as well. I believe 1943-1944, perhaps earlier. Her name was Eunice Jay. Any info or pictures would be greatly appreciated! My Mother -- Pat Louisa Peat (Mrs. Pat Peat O'Neil) is now 95 yrs. During WWII, she served in the W.A.A.F at Medmenham near Henley, in Bucks. working in photo reconnaissance. I think I have some images that I could scan, if that would help. There are a few books out on the role of the W.A.A.F units.